Design-focused commerce company Fab has raised that round of funding we scooped a few months ago. Fab is announcing today that it has raised $150 million in the ﬁrst tranche of the company’s Series D round of ﬁnancing. We’re told that $150 million is the ﬁrst part of a larger Series D round that Fab expects to complete over the next few months. New to this round is Chinese Internet giant Tencent, who will also have a board seat at Fab; and Japanese conglomerate Itochu. Previous investors Atomico, Andreessen Horowitz, Menlo Ventures, RTP Capital, Pinnacle Ventures, Lars Hinrichs, and Docomo Capital also participated in this latest round of ﬁnancing. This brings Fab’s total funding to $310 million. We’re hearing from multiple sources that the pre-money valuation of the company was $1 billion, as we had reported in April (a spokesperson for Fab has confirmed the valuation). And we’ve also heard from a source that Fab will be raising another $100 million or more in the later part of this round. At Fab’s last round of financing in 2012, the company was worth around $600 million. Past investors include First Round Capital, SoftTech VC, Baroda Ventures, Ashton Kutcher, Guy Oseary, Thrive Capital, Kevin Rose, SV Angel, The Washington Post, VTB Capital, Phenomen Ventures and the Times of India. Founder and CEO Jason Goldberg said the company started down the fundraising route in March to raise enough capital to have several years of runway, at least until 2015. He added that for this round there was $400 million worth of interest coming from investors. Fourteen million users strong, Fab is continuing to grow at a fast clip after its initial pivot. Last year, the company saw $120 million in revenue, and revealed in February that sales were up by nearly 300 percent in January 2013 over January 2012. In fact, January was Fab’s third-highest sales month ever. According to the company, Fab should reach $250 million in 2013 sales. Fab’s now achieving 43 percent gross margins, up from 29 percent in 2011. Interestingly, Fab says that most of its revenue is not derived from flash sales, which was the initial model Fab adopted after its pivot in 2011. As we wrote in this profile of the company, Fab infamously pivoted from Fabulis, which was a social network for the gay community, into a flash sales site. Fab says that two-thirds of sales are currently not from the flash-sales on the site, and the company recently rebranded to reflect this change. And 50 percent of Fab’s sales are in home categories. In May, Fab debuted its new design store, which makes it more of an integrated e-commerce site. You can access design pages by room, type of furniture, color, designer and more. International is also a huge potential growth area for the company. Fab has 1 million members in the UK, which is generating nearly 40 percent of its sales in Europe and is its fastest-growing market outside the U.S. Asia is the next frontier, which is why Goldberg and Fab are bringing on Tencent and Itochu as partners. 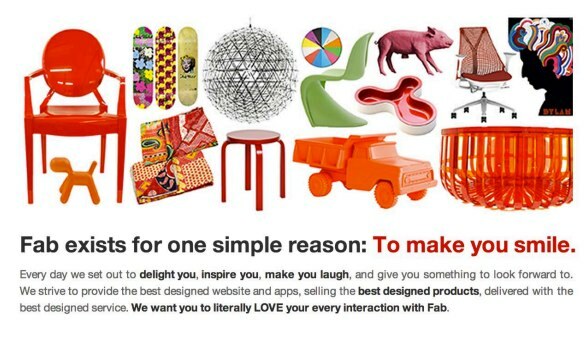 Part of Fab’s plan to take over emotional commerce involves making its own line of products and home goods. Fab is also partnering with designers to manufacture and sell home furnishings exclusively through Fab. Additionally, Fab is experimenting with brick and mortar stores, with the first store debuting in Hamburg, Germany. Mobile is also a huge growth area, with one-third of sales being placed via mobile. And international will also be a major strategic focus for Fab, which just acquired German custom furniture store Massivkonzept. Fab sells products in 27 countries and 40 percent of sales today occur outside the U.S.
$150 million is a lot of cash, and Fab is raising more. Where is the money going? Goldberg says that Fab will be investing in additional enhancements to its supply chain, logistics, customer service, technology, and merchandising. At the beginning of 2012 it took 16 days — on average — from time of purchase to shipping a product. Today, 75 percent of Fab’s orders ship within 24 hours of purchase, and Fab wants to make sure this is the case for 100 percent of the products sold on the site. This year Fab will open its own new Fab-operated warehouse in The Netherlands to serve European customers. In 2014 Fab will open a warehouse in the Las Vegas area. As mentioned above, Fab will also be doubling down on manufacturing and designing more products in-house, as well as working with designers to offer items exclusively on Fab. We can also expect more development in social and mobile. And Goldberg says Fab will be putting more investment in international (likely via more acquisitions, as it has bought five companies in two years). With the Tencent investment, Goldberg says that Fab will be working together to expand the site’s presence in China. As for why Fab has raised as much as it has in only two years, Goldberg maintains that this is how retail works. “Tell me an e-commerce business that is worth more than $5 billion that hasn’t raised a lot of money,” he says. To fund things like logistics, fulfillment, inventory and manufacturing, a business needs a lot of capital, he explains. He adds that if Fab stayed as a U.S. business, the company wouldn’t need to raise as much. There is also now a somewhat clear path towards profitability, at least for the U.S. and European businesses. Goldberg says that Fab will likely become profitable in its U.S. and European operations by Q4 2014 or Q1 2015.